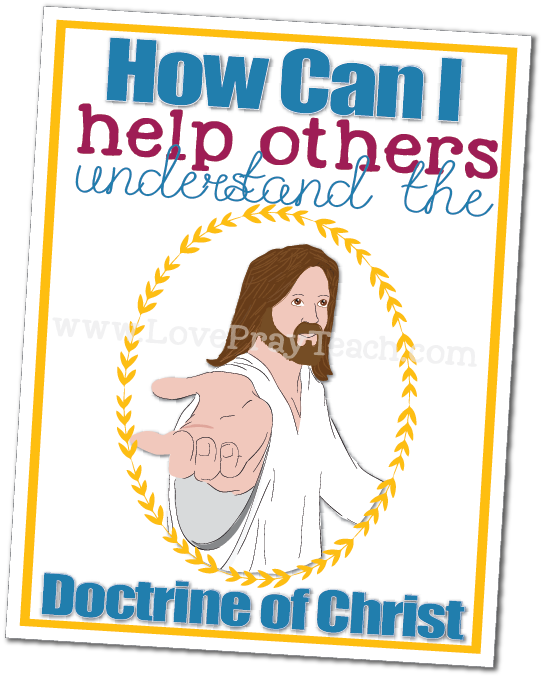 February Youth Sunday School: How can I help others understand the doctrine of Christ? You are here: Home » » February Youth Sunday School: How can I help others understand the doctrine of Christ? Display the poster in your class room at the beginning of the lesson. This is a great way to introduce the topic, let your class ask questions. This is a great way to begin a good discussion. Ask a class member to read this paragraph from the lesson outline. 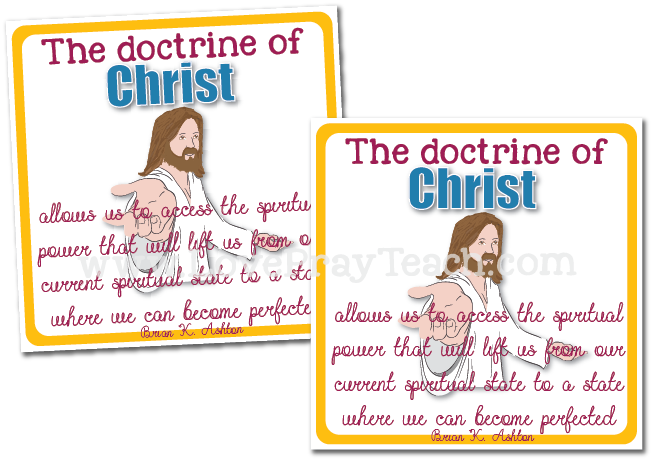 The “doctrine of Christ” is that all men everywhere must have faith in Jesus Christ, repent of their sins, be baptized, receive the gift of the Holy Ghost, and endure to the end. The doctrine of Christ is the only way to be saved in the kingdom of God. It is the foundation of the Church and the central message of its missionaries. 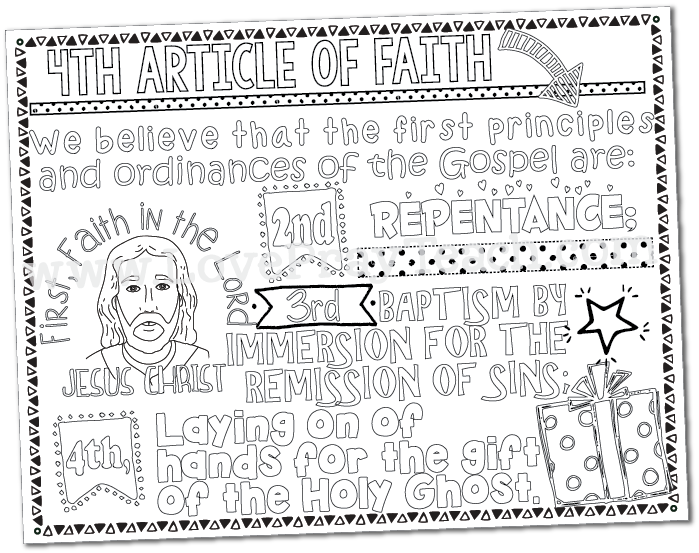 Give each class member the 4th Article of Faith coloring page. You could let them color as you talk or they can take it home to color later. 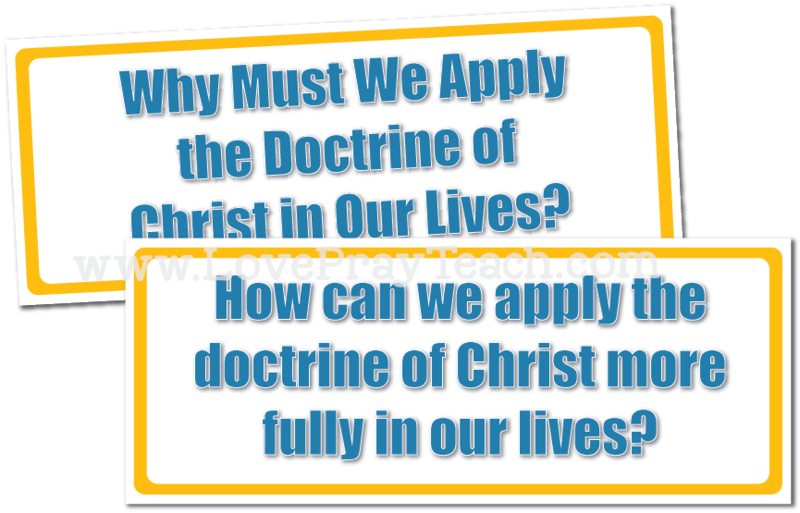 Discuss the principles of Christ's doctrine found in the 4th Article of Faith. Help your class that these are the basic building blocks of the Gospel. 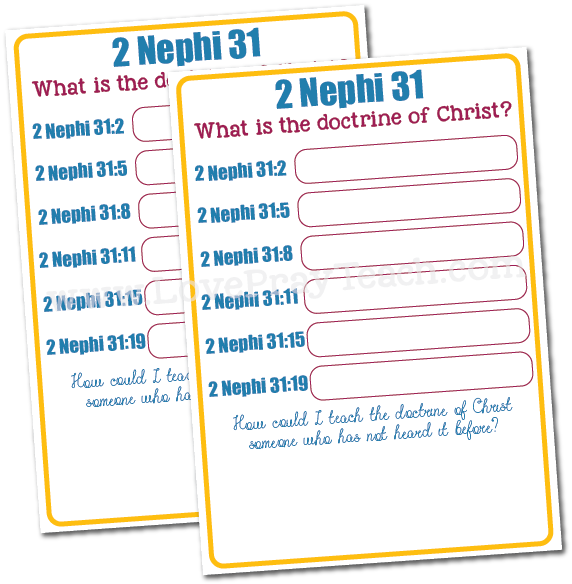 This worksheet will help your class gain a deeper understanding of the principles of the Doctrine of Christ. Ask them to look up each scripture reference to find the principle it is teaching. For example "2 Nephi 31:5 - Be Baptized"
Once they have looked up all the scriptures give them a few minutes to answer the question at the bottom. Invite your class to share what they wrote and discuss the principles found in the scripture references. Place the two wordstrips on the board and give each class member a copy of Brother Brian K. Ashton’s talk “The Doctrine of Christ.” Take turns reading the talk out loud as a class asking them to keep in mind the two questions on the board. Invite the youth to come to the board and write their answer under the corresponding question. This activity is designed to be an open discussion. Let them write anything that comes to mind. Discuss their answers and let them ask any questions they may have. At the end of the activity give them an opportunity to role play teaching the Doctrine of Christ to someone that has never learned it. This could also be done in pairs as if they are missionaries. Give each youth a journal card. Give them a few minutes to think about the lesson and how they are feeling. Encourage them to write down what they learned that has inspired them. Give them the opportunity to share their feelings. Conclude the lesson with your testimony and give each member of your class a handout. They are the perfect size for the youth to use on their bulletin boards at home, taped in their locker at school, they can be collected throughout the year and made into a little book by punching holes in the corners and using a key ring to attach them each week. If your class uses journals or smash books, these are the perfect size to tape into their individual books. If all or most of your class have a smart phone, here is another idea to use for this: text each member of your class this handout during the week to remind them of the lesson. To do this, right click on the picture and save image to your computer. Then email the picture to yourself. Retrieve the email from your smartphone and save the image onto your phone. You can now send the image in a text to your class. February Youth Sunday School: Why is learning an important part of Heavenly Father’s plan? YSS February:How can I use Church music to learn about the plan of salvation? November youth Sunday School:How can I learn to make my own decisions? March Youth School: How can the Book of Mormon help me strengthen my faith in the Atonement of Jesus Christ? October: Youth Sunday School How can I use the scriptures to help others become more Christlike? July-Youth Sunday School:How can I make the sacrament more meaningful to me? January YSS: How can studying the scriptures help me learn about Heavenly Father? July-Youth Sunday School:How can I deepen my understanding of covenants? YSS MAY-What Can I Learn From President Monson About Following The Spirit? Youth Sunday School APRIL-Why is it important to teach pure doctrine?